CW Studio put a team together for the High Line for London Green Infrastructure Ideas Competition for a new London Landscape organised by the Landscape Institute, the Garden Museum and the Mayor of London. The brief was to put forward ideas for new green spaces and places in the city which could add to the capital’s green infrastructure. 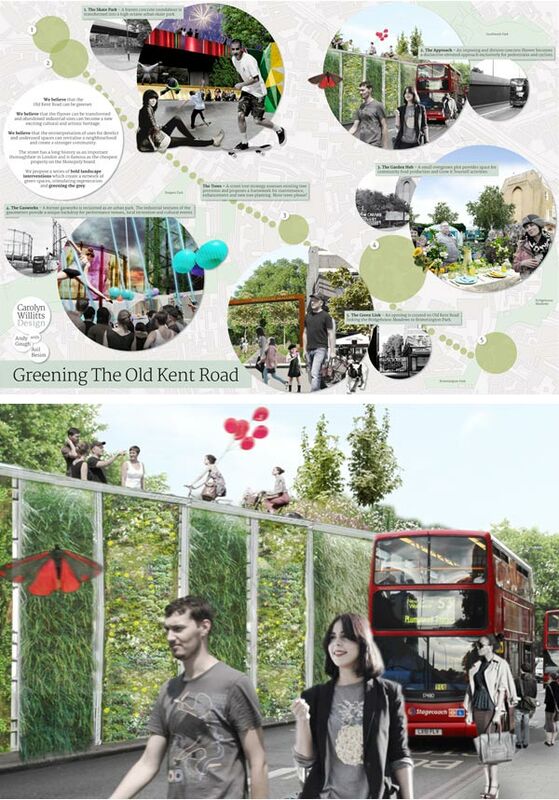 Our design explored ideas for greening the Old Kent Road, and our strong belief that the reinterpretation of uses for derelict and underused spaces can revitalise a neighbourhood and create a stronger community. 1. The Skate Park – A barren concrete roundabout is transformed into a high-octane urban skate park. 2. The Approach – An imposing and divisive concrete flyover becomes a distinctive elevated approach exclusively for pedestrians and cyclists. 3. The Garden Hub – An overgrown plot for sale provides space for community food production and Grow it Yourself activities. 4. The Gasworks – A former gasworks is reclaimed as an urban park. The industrial textures of the gasometers provide a unique backdrop for performance venues, local recreation and cultural events. 5. The Green Link – An opening is created on Old Kent Road linking the Bridgehouse Meadows to Brimmington Park. The Trees – A street tree strategy assesses existing tree provision and proposes a framework for maintenance, enhancement and new tree planting. CW Studio led the team and created the competition design and visuals except for The Gasworks and The Garden Hub which were created by Andy Gough. You can see more images here on the New London Landscape website. The team consisted of CW Studio, Andy Gough and Asil Besim.